Chris Rowlands is a game designer, podcaster, and all around nice guy. 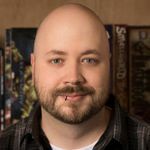 He loves games, and feels that the experiences that tabletop games provide are second to none. He believes that games are important, and that games are for everyone. He is a really nice guy. Funny too.